Disclaimer – We will be carrying the RetroTINK 2X in our store, so we cannot give a completely unbiased review. Nevertheless we tried to be as objective as possible. It is always our policy to stock only products we believe in and we encourage you to check out reviews on other sites too. Since the OSSC landed in 2016, line doubling as a means of upscaling retro consoles has well and truly come back in vogue. If you’re not familiar with the concept of line doubling, it’s relatively easy to explain. Instead of buffering a whole frame of video data when converting from 240p to 480p, we can simply double each incoming scanline. By doing this, we get an image that’s nicely scaled, though only to 480p. Line doubling has one huge advantage over frame buffer based upscaling and that’s input lag, or rather lack of it. With a frame buffer, there’s always at least one frame of lag, with a line doubler, there’s none, save for a few nanoseconds. The OSSC has gone from strength to strength since it was launched, but that’s not to say it’s perfect (just really darn close!). One feature the OSSC does lack is support for composite video and S-video. There simply aren’t the connections on the OSSCs video decoder chips to make this possible. Now, a new kid has arrived on the block, promising to offer both composite video and S-video line doubling support for retrogamers world wide, say hello to the RetroTINK 2X. At just 7.5cm by 5cm by 3cm the RetroTINK 2X is the most diminutive line doubler yet. In its small footprint it manages to pack in Component video, S-Video and Composite video inputs, as well as a pair of standard RCA connectors for stereo audio input. For output, there’s a single mini-HDMI port. Power is via a 5 volt connection to a MicroUSB port. This can be powered using a power supply unit or simply plugged into most USB ports and the power drawn from there. As long as the USB port can provide enough ampage you’re good to go. This means that, on many modern televisions, the RetroTINK 2Xcan be added to your setup without needing another plug socket at all, as it can simply draw the required power from the TVs USB port. On the side of the device there are two push buttons. The first button changes between the RetroTINK 2X’s inputs. There’s component video, S-video and composite video. European gamers might be disappointed to find that there’s no RGB input and no, unfortunately, RGBs cannot be connected by using the component video inputs along with the composite video input for sync. For those looking for the best quality connections, we can report that HD Retrovision’s component video cables are fully compatible. The second button on the device switches between the three modes. There’s transcode, line double and double plus filter. The RetroTINK 2X is really two devices in one, a transcoder and a line doubler. Although the 2X part of the name is because of it’s line doubling capabilities, it can equally apply to its versatility here too. Despite it’s diminutive size and low cost, the RetroTINK 2X is actually a fully functioning line doubler. Feed in a 240p signal, turn on line double mode and a perfectly scaled 480p image is output. There are two modes available when line doubling with the RetroTINK 2X, line double and line double with smoothing. Sadly, there’s no scanline mode available with the RetroTINK 2X on its own. The basic line double mode performs exactly as you might expect, scaling a 240p image to a 480p image by simply doubling every line. Line double with smoothing mode adds a graphical filter to the output to smooth away some of the jaggy edges. While we’re not usually a fan of smoothing filters like Scale2x or similar, it is hard to deny that the smoothing filter on the RetroTINK 2X looks pretty good, especially on certain titles. We were particularly impressed with the effect in N64 games, especially when using a modded console with component cables. Like the OSSC, the RetroTINK’s line doubling is lag free, even when using the smoothing filter. The picture below shows an example, the image on the left is without the scaling filter and the image on the right shows the scaling filter applied. Note that the RetroTINK 2X supports only 240p and 480i signals. Feed in a 480p signal and, unfortunately, you will get no image at all. This is true in line doubling and in transcoding mode. Interlace video is handled by the RetroTINK 2X in a similar manner to the OSSC. When in line double mode, interlace video fed into the unit is run through a simple bob deinterlace and output as a progressive image which does exhibit some shimmering. In transcode mode, the RetroTINK 2X simply digitises the signal as it is. As you’d expect from a line doubler, 240p to 480i transitions are fast. Until now, OSSC held the crown for these problematic titles that like to change between display modes on the fly, but RetroTINK may actually beat the OSSC at its own game here. 240p to 480i transitions seem a fraction of a second faster on the 2X. In one instance, on a Panasonic TX-P42GT60B plasma TV, we actually saw what we thought was impossible, a 240p to 480i transition in Resident Evil 2 on the N64, that the TV handled exactly like a CRT would, with no picture blanking at all! Before you get too excited we should say that this set was certainly the exception rather than the rule and on every other set we tried there was always a split second at least where the image was lost during one of these transitions. Note that there’s no way to set the RetroTINK 2X to line double 240p while passing through any 480i signals it receives. It’s either line doubling or transcoding for everything. The most popular console that outputs composite only, without a hardware modification, has to be the Nintendo NES. However, our NES was RGB modded some time ago and this has the side effect of disabling the consoles composite video output. Instead, we used our trusty SNES mini for the bulk of the tests. We also gave a composite modded Atari 2600 a spin. It’s important to remember that only so much can be done with composite video, but nevertheless the RetroTINK 2X definitely holds its own. Picture quality was an appreciable step up from our old Sony YR3000 transcoder. While still not as kind to composite’s shortcomings as a CRT TV is, for those consoles and computers that can’t or won’t be modded, the results are perfectly good enough for enjoying most classic games. Here are some shots from the SNES, line doubled by the RetroTINK 2X then scaled by the DVDO Edge for capture purposes. Remember the DVDO Edge’s now dated scaling engine does add a little ringing to 480p images. The colourbleed test really shows the limitations of composite video. 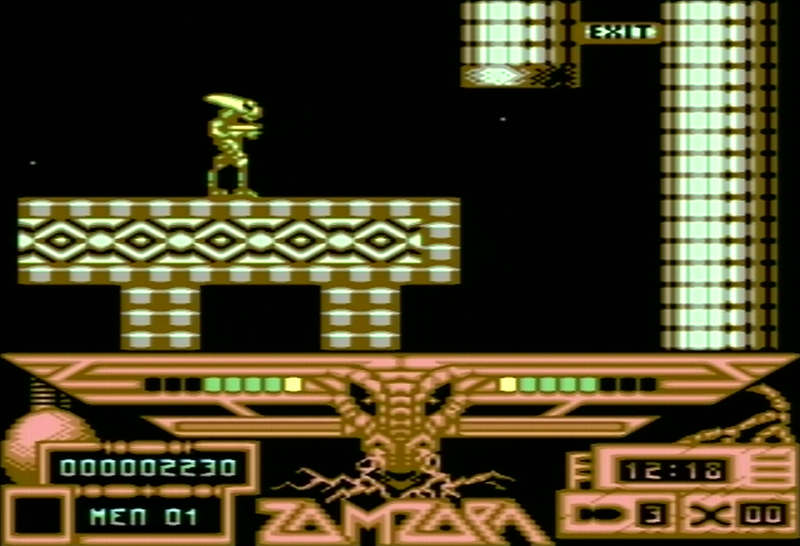 S-Video performance was evaluated using a LumaFix enabled PAL C64. We also tried a 3DO console and a Dreamcast. No question here, this is the best S-Video transcoder we’ve tested. Easily beating our old Sony YR3000. The image was clean, with virtually no colour bleeding. Compared to a pure RGB output the image is quite soft, but this is definitely the best we’ve ever seen a PAL C64 look on a HDTV, besting the Framemeister both in terms of picture quality and input lag, as long as your TV scales 576p material well, of course. For an example screenshot, see the Zamzara game screen shot earlier in the article. To test the component transcoding/line doubling we used a RGB modded SNES Mini console and a set of HD Retrovision component video cables. There’s really nothing to fault here at all. All the usual 240p test suite tests passed with flying colours. The image was sharp and free of colour bleeding and noise. Update – Under very close scrutiny, we were able to detect a very tiny amount of noise in grey areas of an image compared to the OSSC. However, this was when inspecting the image from a distance of (literally) just a few centimetres. Audio performance on the RetroTINK 2X was good although we would have to stop short of saying it was perfect. In general use there are no issues with the audio digitisation but on bassier sounds like explosions the output may sound a little rougher than it did through the OSSC. This isn’t something you’re likely to even notice on a TVs speakers, though you might if you have an external amp or home theatre system. In that case of course, it’s usually perfectly easy to route audio around the RetroTINK anyway. By putting the RetroTINK 2X into transcode mode, incoming composite, s-video or component signals are simply transcoded and digitised into HDMI. Support for 240p is rare in the world of HDMI, but by adding a simple HDMI to VGA converter, you can convert the signal back to the analogue domain again. This makes the unit a perfect transcoder to go with 15khz displays like PVMs, or of course, the OSSC. RetroTINK and OSSC – A match made in heaven? Compared to the OSSC, the feature set in the RetroTINK 2X is quite basic. There’s no line triple or similar modes, no advanced timing options or other options. Nevertheless, the device does the job and is a very affordable way to add 240p compatibility to flat screen televisions. What do you do if you want composite video and S-Video support but also want the advanced features of an OSSC? In that case, you can simply use the two devices in tandem. Piggybacking the RetroTINK 2X to the OSSC is easy. All you need is a simple HDMI to VGA adapter. We’ll be carrying a tried and tested model in our store that fully supports 240p output and doesn’t appear to crush blacks or over-saturate whites. With a suitable adapter in hand, set the RetroTINK to transcode mode, connect the HDMI to VGA adapter to your RetroTINK, then connect the output of the adapter into your OSSC via the VGA port. Finally, switch the VGA port on the OSSC to 480p mode (Sampling opt->480p in sampler->DTV 480p). You are then good to go. Now you have access to the OSSCs famous scanline engine and line multiplication modes with all your composite video and S-Video sources. You can also access things like the advanced timing tweaker, allowing you to center the image using the backporch controls or apply a little faux zoom using the V.Active controls. Apart from a slightly messy cabling setup, using OSSC and RetroTINK 2X together is a real treat. Composite and S-Video sources need no longer be a stranger to the OSSCs powerful line multiplication engine and while they won’t look as good as native component or RGB sources, this powerful little combo is the best way yet to display these sources on modern flat panel monitors or TVs. Playing C64 games with this combination was a real treat and we took several screenshots of the various modes. Being as our C64 was PAL, line triple was as high as we could go on the DVDO Edge, but this still provided fantastic results even on a 4K TV. RetroTINK 2X is a triumph of a product for three distinct niches. For folks that need the most affordable way to get 240p compatibility on a HDTV, the RetroTINK is a neat plug and play solution. However it must be said that European gamers in particular may be put off by the lack of RGB inputs and if extensive new cable purchases are required, it may simply be better to go for an OSSC in this case. For folks that need a simple, high quality transcoder that supports 240p, then a RetroTINK 2X coupled with an affordable HDMI to VGA adapter will work perfectly. No need to track down an expensive and rare composite video card for your professional CRT monitor, just let the RetroTINK 2X handle things. Finally, for anyone wanting to add composite and/or S-Video inputs to the OSSC, the RetroTINK 2X is the best product on the market for this purpose. Again, a simple HDMI to VGA adapter is all you need to unlock this functionality and we feel the screenshots speak for themselves. The RetroTINK 2X will be available in our store around September 2018 time. As with our other popular products, we will be operating a waiting list, so if you wish to be notified when the unit is available, simply click here and let us know. Powerful, flexible and affordable, a great addition to any gamers AV toolbox. That looks like a fantastic device. Just to make sure: the HDMI to VGA adapter will not add any lag? The one we will be selling will not add any lag. May I ask which adapter you will be using? I recently purchased the Tendak VGA to HDMI adapter based on the recommendations on JunkerHQ. Is this an appropriate adapter or will the one you sell be better? I’m still looking to be honest, did you find the Tendak to be as good as hoped? According to Mike Chi himself, it’s a limitation in the video chip; specifically, it only supports luma-based formats (So only YPbPr, YC (S-Video), and CVBS) and requires sync-on-luma, so it is incapable of processing RGB input. If they really want to use the RT2X with their RGB SCART consoles, they can get a ShinyBow SB-2840 and some RGB cables; but then you’re paying close to OSSC money, so just get the OSSC at that point. That should have read “RCA cables” instead of “RGB cables”. Looks promising, but, the soft filter is optional? I never liked those, I prefer the razor sharp pixel anytime! Yes of course totally optional. For those of us that have already purchased a Retrotink-2x, can you provide a link to the suggested HDMI to VGA adapter that should be used when linking a Retrotink-2x to an OSSC? Even better, we’ll have some kits in store soon, everything you need for RetroTINK to OSSC goodness. Even as a line doubler it would still produce lag right? Even a 240p signal doubled to 480p, requries a modern TV (minimum 1080) to upscale the 480p to fit the screen. Help me understand. Line doubling produces only a few nanoseconds of lag. It’s rarely scaling that causes lag on HDTVs, usually it’s all the picture processing/postprocessing, but yes using a RetroTINK won’t remove the lag that your TV does on its own (at all resolutions including native). Hi! Just adding to that – modern TVs usually scale 480p to their native resolution much faster than 240p/480i, which requires not only scaling, but de-interlacing (which also will result in visual artifacts). Typically you’re looking at going from 4-5 frames (direct to TV) down to ~2 frames (using a doubler like the 2X or OSSC). Once you have 480p, you can now also feed it into a computer monitor, which is generally very quick to scale up to their native resolution. In the tests I have done with Leo’s lag tester and my DVDO I’ve found that scaling adds no measurable input lag at all on every set I tried, all the extra lag is down to the picture processing. Ofc it can do easily Scart RGB, you need a Scart to YUV adapter and there you go. Of course though such adapters add considerably to the total cost of the unit. Will the retrotink 2x do a straight up transcode and output 240p? Is it working well on a original Xbox? No I would not recommend RetroTINK for that as it doesn’t support 480p. Yes it does, well done you, the RetroTINK however does not. to play a ntsc-j ps2 on a 1080p monitor via hdmi would this be enough? RetroTINK only supports 480i and lower, so you’d want OSSC for 480p PS2 games. I do not get any jitter with my C64 at line triple. CREATURES on the C64 will rapidly swap colours of some sprites to give the impression of more colours. I’ve found that, depending on deinterlacing settings, that only one of the colours used will be shown. I have managed to get a correct display using AmarecTV through my capture card. Is there any chance you can confirm the RetroTNK takes care of this properly? RetroTINK handles all 240p effects correctly. Have you tried AppleII or cga color Composite? Does it show the correct colors? I don’t have access to those systems unfortunately. When will this be available? I put myself on the notification list a while back but haven’t heard anything yet.. thanks. I thought this was available in September. It’s Oct 3rd. Any idea when you’ll have it for sale? Take my money already !! Is this good for ps2 games that run in 480i ? or play ps1 games on ps2 by component ? You should use 480p mode wherever possible. RetroTINK does similar deinterlacing to OSSC, which means no input lag but some flicker. unfortunately i have some curious issues with my RetroTink 2x. First of all i want to point out that i think this is a very cool little device, offering a valuable option beside ossc and framemeister, and i am pretty sure, that it will work out as desired for most of the people. Does this support the standard AV cable? That comes with most of thenolder consoles like snes ps2 and ps1? Talking about the red white and yellow that goes into a scart connector of sorts. It does however we’d recommend using better cables wherever possible. Yes, it supports the RCA composite AV cables that are commonly found in 8-bit and 16-bit game consoles (NES, SNES, etc). Unfortunately it appears not, sorry. Ok so here’s my question. My goal is to just capture S-Video. S-Video just seems to be the happy medium for me since GameCube, and N64 work out of the box. My setup will be all S-Video from my consoles to a S-Video splitter, one side will go straight to my CRT TV and the other to either a Retrotink or I found a tendak S-Video to HDMI on Amazon for $33. Am I correct in assuming that the main reason a Retrotink 2X is $100 is because of very low input lag? Or is video quality a factor as well. Since I will be playing a raw signal directly in my CRT TV and I don’t care about input lag on my capture device do I really need the Retrotink? Has anyone ever used the Tendak S-Video to HDMI converter? Thanks for any feedback. It has low input lag and processes 240p correctly, i.e without applying deinterlacing, without combing artefacts, etc etc. Will this work well for n64 and GameCube? Also do u have these in stock? Any estimated date of a restock? Anybody know a good AV switchbox for this? I have a $10 off Amazon with four inputs, but it introduces interference if I use it with the Retrotink. If the bass sounds are a bit rough on my soundbar+subwoofer what can be done?